The government’s green-light plus its ultra-low energy costs is making the country an attractive place for cryptocurrency activities. Earlier, representatives from Central Bank of the Republic of Uzbekistan referred to cryptocurrencies as “instruments of terrorism financing.” But the government is flipping its views and is now all for the technology—provided their officials come up with a solid regulatory framework. Uzbekistan President Shavkat Mirziyoyev has signed a decree urging officials to draft laws regulating cryptocurrencies in the country, tapping the Central Bank, the Ministry of Information Technologies and Communications, the Finance Ministry, and the Ministry of Economy to take charge of the initiative. Along with the pending bill, the president has also ordered the creation of a center that will focus on blockchain innovation and opportunities, and called for the development of contactless payment methods. Further legitimizing cryptocurrencies, the new center will also increase efforts in supporting distributed ledger (blockchain) developers, news agency Vzglyad.az reports. Coupled with low energy costs in the country, Uzbekistan just might become a leading hotbed for cryptocurrency activity. Uzbekistan is the largest electricity producer in Central Asia. But while the country is self-sufficient in terms of its energy needs, the supply to rural areas has been unreliable, with blackouts often occurring for several hours per day. Since 2007, several renewable energy projects have been trying to alleviate the issue in rural areas—where 60% of the population live. And last year, the government allocated $5.3 billion for 810 projects dedicated to increasing the share of renewable energy sources to its overall electricity supply. 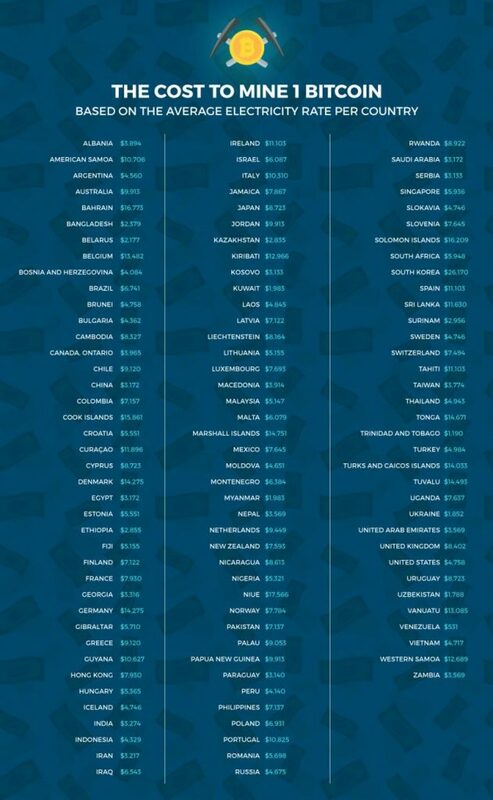 Uzbekistan has already secured its place as the third in terms of lowest mining cost per bitcoin. According to Energypedia, electricity costs only $0.035 per kilowatt hour in the country. It costs around $1,788 to mine one bitcoin in Uzbekistan. With more developments planned, this cost can be driven down even further—and Uzbekistan could possibly inch their way to the top of mining profitability.